Today's sporting number comes from the hotly contested series from one to fifteen. These are the numbers that cover the action for all but the most lunatic of sporting occasions and, as a result, have come to be associated with all kinds of different personalities and disciplines. Number 3 is the number that AC Milan retired in honour of their stalwart defender Paolo Maldini; it is also the number carried by the legendary Dale Earnhardt throughout his career in stock car racing. However, it would have been remiss of me to not award my number 3 to the Sultan of Swat. The 20th Century saw the invention of many things that we now accept as facts of life without really thinking about them and one of these was international sporting superstars. 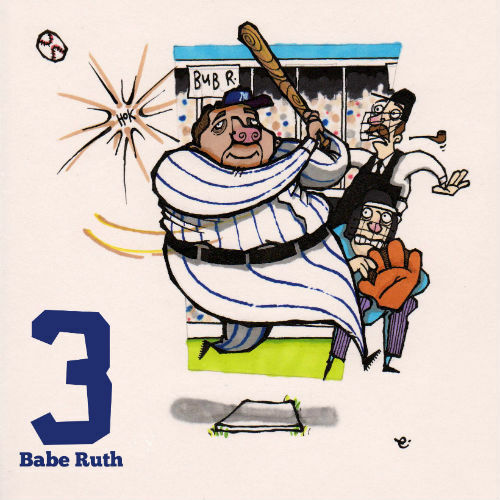 George Herman "Babe" Ruth was one of the first and, over a century on from his Major League Baseball debut, he remains one of the biggest. If he hadn't been born, someone would have had to invent him.